This tray is Absolutely Beautiful! It is a one of a kind Handmade Planks & Paint Custom Design. 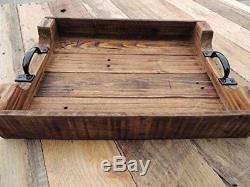 Made from Reclaimed Rustic Pallet / Barn Wood. Wood is hand picked for the design to give it that extra rustic beautiful look. Very heavy duty, will last you forever! 24" x 30" and can vary slightly by 1/4. The Handles are black metal. This Tray is perfect for an ottoman. Large coffee table, or for a large dining room table. Bottom of tray has Felts pads so that it does not sit directly on your furniture and slides without scratching. Absolutely Beautiful and can be a Very Useful Decor Piece! The item "Rustic Wood Ottoman Table Serving Tray -XTRA LARGE 24X30" is in sale since Monday, November 27, 2017. This item is in the category "Home & Garden\Kitchen, Dining & Bar\Dinnerware & Serving Dishes\Trays". The seller is "rmadeals" and is located in Myrtle Beach, South Carolina.